Nestled in a serene lakefront site along the main boulevard in Palm Beach, this house engages the landscape with several architectural elements. The solid and stepping vertical planes at the entrance court seamlessly unite house and landscape. The floor and walls of the house extend beyond its structure, traversing the landscape and connecting the house with the sculpture garden, playground, swimming pool, and pool house. The interior features towering walls and full height glass windows with views of the lake on three sides. The punctuated roof, terraces, and open spaces enable a dramatic interplay of light and shadow both inside and outside. 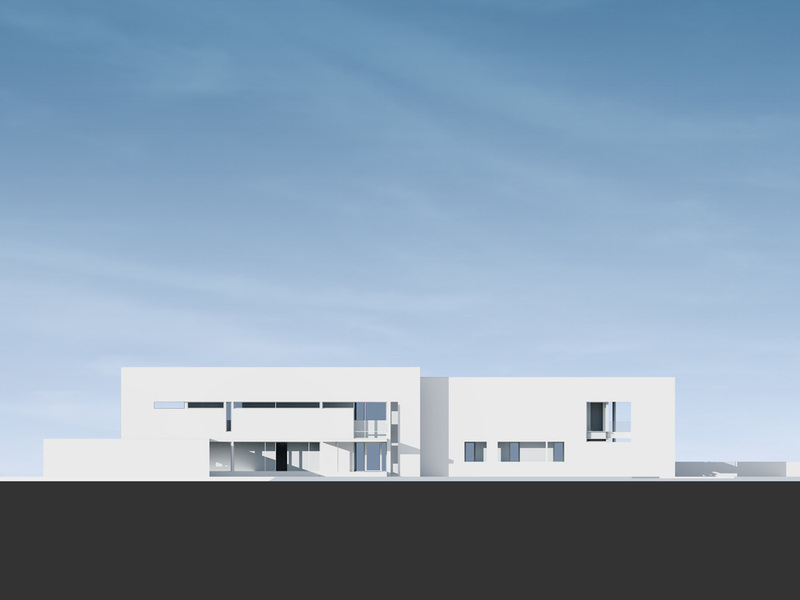 The split and layered skylit gallery and entrance hall, the core service zones, and the main rooms are composed together in a dynamic yet simple layout. The two roof planes hover over corresponding glass volumes that define the house: one section contains a two story living room, dining room, kitchen, and second floor master suite; the other section incorporates a family room and library on the ground floor, and the children’s bedrooms on the two floors. The details on both the interior and exterior of the house are minimal and precise. Materials include glass, steel, limestone, metal panels, and plaster.